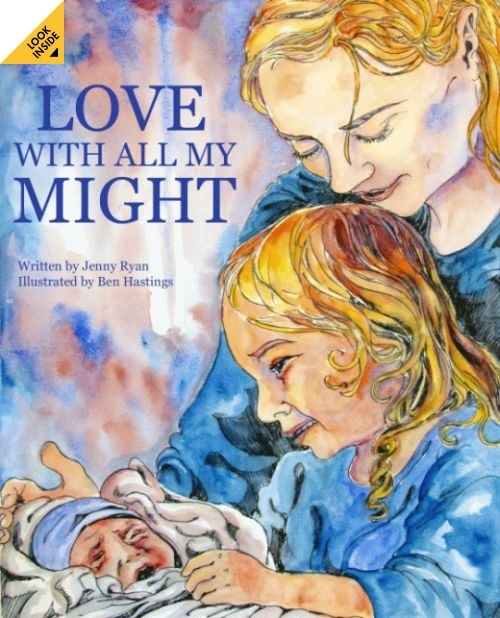 Love With All My Might tells the story of a growing family through the eyes of a little girl and her evening prayers. Through beautiful illustrations and gentle rhythmic words, a Catholic culture of love and prayer is communicated to the readers. From adoring our Lord in the Eucharist to being tucked in at night, your child will recognize these familiar moments and will want to read this book again and again. Jenny Ryan was born in Ontario, Canada and moved to North Carolina with her family at the age of thirteen. She graduated from Belmont Abbey College with a bachelor's degree in Theology & Pastoral Ministry. After working as the Director of Campus Ministry at her alma mater, Jenny settled down with her husband, John, to begin the adventure of learning to live as a family. They now have five children and enjoy taking them on whatever adventures they can find. Ben Hastings grew up with his nine siblings in Texas and Alaska. The beautiful landscapes that have surrounded him inspire his artwork and bring life to is pictures. He graduated from college in 2004 with a degree in liberal arts, and has also studied drawing and painting. His preferred medium is watercolor, but he also enjoys acrylic. In addition to painting, Ben enjoys visiting his siblings and their families, who give inspiration to his pictures. All artwork copyright Benjamin Lee Hastings . Do not duplicate or use without express written permission. - It's on blogger!